Why so common and severe? Pneumonia is an acute inflammatory response deep in the lungs, in the alveoli. When a tissue is infected or injured, there is an inflammatory response that is, in the simplest sense, an accumulation of pus. When the deep lungs are injured or infected, pus accumulates there. Pus in the alveoli is pneumonia. Pneumonia is most often caused by an infection, and a wide variety of microbes can infect the lungs. Many times pneumonia is due to bacteria, but it can also result from viruses, fungi, and other microbes. The most common cause of community-acquired pneumonia is the pneumococcus (Streptococcus pneumoniae). Hospital-acquired pneumonia often results from Gram-negative bacterial rods. In a healthy lung, inhaled air flows through the airways and alveolar ducts to the alveoli. The alveoli are air sacs surrounded by very thin walls containing blood. At this site, gases (oxygen and carbon dioxide) exchange between air and blood. 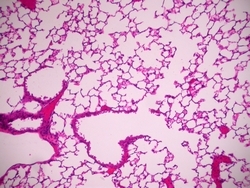 The response to infection – the pus accumulating in the lungs – is crucial to outcome. This pus contains blood elements, white blood cells (particularly a group of cells called neutrophils) and plasma proteins (particularly a group of proteins called opsonins). These cells and proteins are essential to killing the microbes and overcoming infection. Therefore, when we have pneumonia, we have to get these cells and proteins to where the microbes are, in the lungs, or we may succumb to the infection. However, this same pus is dangerous. Neutrophils make toxic and degradative products that are useful in killing microbes, but they can also damage the lungs. An example is hypochlorite, the active chemical in bleach, which is synthesized by neutrophils in pneumonic lungs – good for killing bacteria, but not so great for lung cells. In addition, the accumulation of plasma proteins results in a fluid build-up in the lungs, called pulmonary edema. Pulmonary edema makes it harder to breathe and harder for oxygen and carbon dioxide to pass between blood in the lungs and inhaled air, as these gases need to do for the body to function. Therefore, regulation of this accumulation of pus is critical; we need enough to fight the microbes, but not so much that our lungs have trouble working properly.